joanofdark.com: Finished Time Traveler and the cult of puff. Finished Time Traveler and the cult of puff. Hooray! 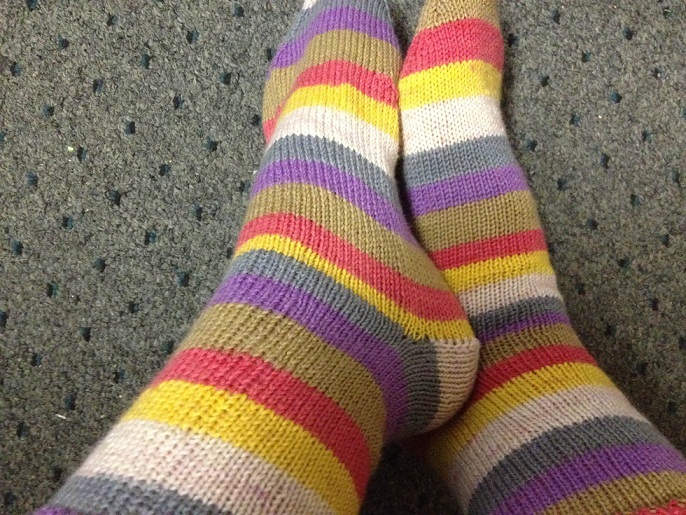 I finished my Time Traveler socks! As I've said before, I'm usually not one for knitting socks. I loved making these though, and adore the yarn! I didn't turn the heel correctly I'm afraid. 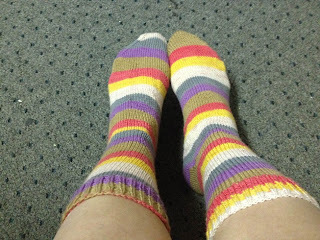 I didn't have a pattern, I just was at Inconjunction, had some sock yarn, borrowed some sock needles from Laura, and asked her what a standard cast on was. Then I started knitting. 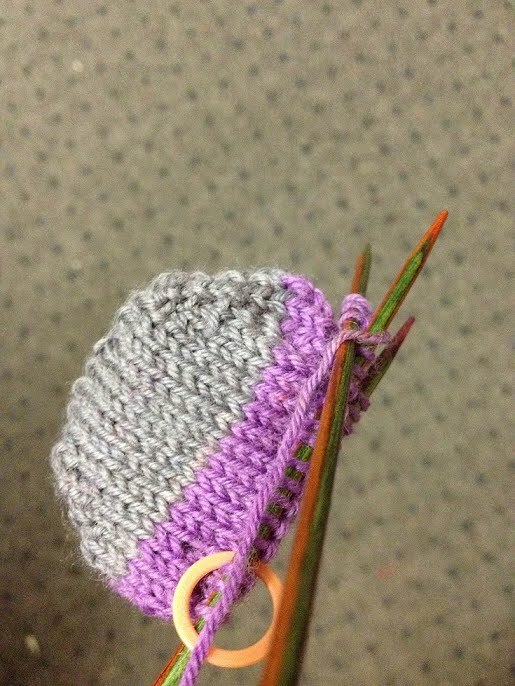 So I tried to remember how to turn the heel, but didn't do it at all properly. I realized when I finished the first sock, then said, "whatever" and did the exact same mistakes in the second sock, so that they would at least match. As I said, LOVE this yarn. I did notice a teeny tiny bit of bleed in all of the cream sections, however. Not a really big deal but I'm wondering if it'll wash out. 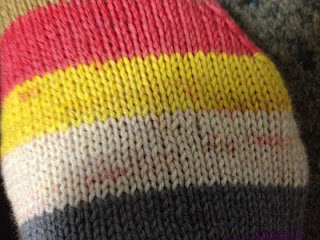 Of course, finishing the socks means I have leftover sock yarn. What the hell does one DO with leftover sock yarn? Oh yea! I'm joining the cult of puff! Hexipuffs that is! Why not? I've got lots of little bits of yarn, might as well make a Beekeepers Quilt! Right. No more goof off knitting! I have DEADLINES! Where did they come from? I mean, I swear they've snuck up so quickly! Are the weeks shorter? Did we move to 20 day months and 12 hour days when I wasn't looking??? I'll leave you all with a cute video of Sassy Burrito howling for the first time, and a sideways video of us racing chihuahuas in a swimming pool. Oh man. I haven't even LOOKED at how many it takes to make a blanket. I just figured I would keep making them until I thought I was close. But 200+ sounds daunting! bI am making a full quilt (400+) puffs. I have seen other knitters make cat cushions, seat cushions for chairs, coasters for glasses, etc. These take considerably less puffs, of course. I bet one of the animals you have would love a bed made of puffs. Lol!